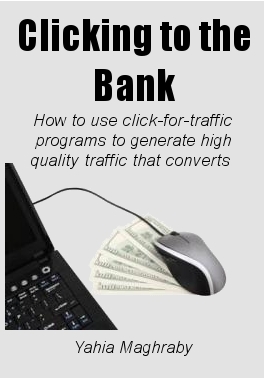 Introducing my free ebook: Clicking to the Bank, in which I explain how to use the free click-for-traffic programs like traffic exchanges to generate quality website visitors who convert to buyers/leads. If you have comments, questions, or suggestions to improve this guide please use the comments section below to let me know and I promise to revise this guide accordingly. Also if you like the guide please share this page with your facebook friends. It’s free to download and there is no opt in required. Click here to download Clicking to the Bank. Clicking to the bank. How to use click-for-traffic programs to generate high quality traffic that converts. On this page you’ll find the best deals in terms of value per dollar spent on hosting and autoresponders, the two services you’ll need to make money with any source of traffic, not only click-for-traffic services. Currently there’s a hot deal on ipage.com. Web Hosting by iPage – $2.25/month only and it comes with $300 of free advertising on sites like Google, Facebook, Bing & Yahoo. It also includes a free domain for the first year. Yellow page business listing is included. Also there’s Award Winning Web Hosting for $1.99/month. It comes with $100 free advertising from Google, Yahoo, Bing, and Facebook, in addition to yellow page business listing. My favorite is MaxBounty’s web hosting. Fast, reliable, and very affordable. And it also comes with $200 in advertising credit that can be redeemed with Google and Bing/Yahoo. The best value for money in the autoresponders services hosted by the company (not by you) is iContact.com : The first month is free and then $10/month. Compared with $20/month and up, together with a strong record of deliverability, it’s the best value. Replace the url http://www.youtubewhateverwhatever with your desired youtube video url. Update: May 26th, 2014 I added a codes section to the end of the book. If you have a special request please leave it in a comment below.